Here is an action-packed video (4:20) about the whitewater kayaking at Rockbrook. See the beautiful rivers, the exciting trips, and excellent instruction that makes up our kayak program. We’re very fortunate here in the southeast US to have one of the best environments in the world for learning white water. The one thing I love the most about paddling is watching the girls overcome their challenges and really learning that they can accomplish so much more than they think they can. It doesn’t have to be a giant rapid where that happens. Sometimes it’s as simple as doing a peel out of an eddy. Other times it’s going down a big Class III rapid and you see that look of excitement on their face when they do it. My favorite thing is seeing me or other people roll back up when they flip over, or going over the rapids and accomplishing my fear of doing them. I’d never done whitewater kayaking before I came to camp and I’ve done it for two years, and now we’re some of the best kayakers at camp, which is great. That’s part of the fun of the program, is taking those girls who maybe haven’t done much physically in the past and teaching them that they can do things physically through the medium of taking them on the river. I started paddling two years ago when I was a first-year middler. It was my first time doing kayaking and I’m very proud of myself getting this far and being so comfortable in the Class III rapids, and even some of the Class IV rapids. I started paddling when I was a first year senior. And I kind of just went with the flow, like, if someone went down a rapid, I tried to follow exactly what they did, but now I feel comfortable that if I get out of line, I can still find my way around rocks and make my own path. We offer our trips in a progression, where anyone who’s a Middler or a Senior at camp can start off by going on our French Broad trips, which are just moving flat water. And then we progress up to more advanced rivers as we go along. We’ve gone down the French Broad, the ninth section of that. We’ve done the Chattooga, the Lower Green. Big Laurel. The North Fork of the French Broad. The Tuckasegee, the Nolichucky, the Nantahala. Safety’s a top priority in the program. We maintain a ratio of at least one instructor for every four campers. And on the more advanced rivers, we’ll keep a ratio as high as one instructor for every one or two campers. We use a combination of shore-based safety with rescue ropes and on-water safety with safety boats that can get there and get hands on the kids. We try to have everyone perform a wet exit in the lake, which is just the process of pulling the skirt off of a kayak while it’s upside down in the water. 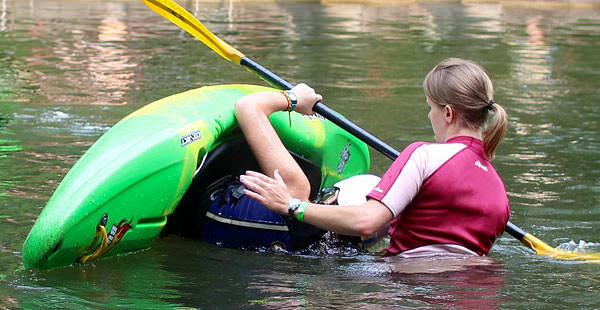 We will also offer roll clinics where we can start teaching girls how to roll their kayaks back upright if they flip over. The paddling program at Rockbrook, like the rest of Rockbrook, is all about having fun. We like to go out and enjoy the environment that we’re in, and we feel that learning the skills on the river will come from just having fun on the river. The kids become more comfortable, and therefore perform better once they get back in their kayak. We also teach in a non-competitive and encouraging environment for the kids. They have an opportunity to look at the rapids when we’re out there and decide whether it’s something they’re comfortable with doing. And they always have the option to walk around or choose maybe not to go to a particular river if they think they’re not ready for that one yet. We really focus on having the kids who have the skills teach the others and encourage the others, and through that, build friendships while they’re on the river and build partnerships for getting through the challenges that we face out there.